This article is slightly different than the version printed in the magazine as this was converted directly from the author’s word processor file. The long promised greenhouse effect has finally arrived. Combustion of hydrocarbon materials to produce energy has resulted in an increase in the level of carbon dioxide in the Earth’s atmosphere. This causes more heat from solar radiation to be trapped in the atmosphere that would otherwise be radiated into space. The increasing temperature of the atmosphere will cause a change in climate and weather conditions across the Earth. Virtually all atmospheric scientists on the Earth agree that the effects will be bad for humanity. The effects of greenhouse warming are just now beginning to become observable to people in general. But, even if we take measures now to reverse the effect, it will take many decades before those effects would begin to be felt. The September/October issue of the Sierra, the magazine of the Sierra Club, reported that atmospheric carbon dioxide in the atmosphere increase from 280 parts per million (PPM) in pre-industrial times to 360 PPM today. The Intergovernmental Panel on Climate Change (IPCC) has estimated that, if we continue on our current course, this will rise to somewhere between 480 to 800 PPM by the end of the next century. Well, so what? We might have to wear our sunglasses more often and increase our collection of T-shirts. This seems to be a common attitude among those with little understanding of the consequences. Just what are the consequences? Reported in same issue of Sierra as above was the fact that although there were some viscous winter storms, the period between 1991 and 1995 were the warmest years on record. 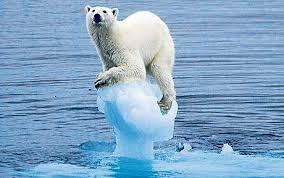 Human activity has increased the Earth’s temperature by one degree in this century and more is scheduled in the future. These temperature changes will not be equally distributed. A recent news report stated that since the 1930’s the Antarctic ice sheet has probably decreased by as much as one fourth of its original mass. The oceans are rising, threatening all areas bordering them. Another effect is that as the temperature of the oceans increase the volume occupied by the water also increases. Summer heat waves in 1995 killed so many people in Chicago that the city morgue overflowed with bodies. As temperature increases, diseases regarded as tropical begin to move north. Sierra reports that a study by the Journal of the American Medical Association states that deaths from malaria could increase by a million worldwide, a two-thirds increase. The same could be expected of other diseases. Another impact could also be that the rate of mutation could also increase due to higher temperatures which could mean that diseases could much more quickly become immune to the medicines designed to cure them. Species have adapted to the current environment over thousands if not millions of years. The time scale over which global warming is occurring is a geological instant. There simply is not enough time for many species to adapt. Both plants and animals will die. Species that produce many offspring over a short life span will probably survive the best. This includes most insects, bacteria, and viruses. Probably most freshwater fish will be lost as well as many birds. Vermont will probably no longer have any sugar maple trees. Sierra magazine reported a conversation between Vice President Al Gore and a mayor of a town in North Dakota who recalled having six hundred-year floods in the last ten years. Stronger and more numerous hurricanes appear likely and now may begin occurring in the Pacific with greater frequency. The simple fact that a warmer atmosphere contains more energy will most likely produce more violent weather. A study by the Japanese government predicts a 60% increase in Atlantic hurricanes. Many of the world’s governments will shortly be meeting in Kyoto, Japan to discuss measures to prevent or at least reduce global warming. This appears unlikely to result in anything substantive. At this point all nations look to the United States for leadership in the matter since it is they who produce the largest amount. The U.S. has said that it wants to do something about the situation as long as it doesn’t disturb the economy. Australia doesn’t want anything to disrupt its export market for coal. China is expanding its economy at the expense of large environmental degradation and doesn’t want that to stop. Japan says that it already is an environmental leader and should not have to increase its commitment when countries, such as the U.S., are doing so little. Poorer countries say it’s the rich countries that are doing most of the polluting. Meanwhile nuclear power corporations are drooling at the prospect. Their assumption is that the only way to reduce carbon dioxide emissions is to increase power production using nuclear power and that means money for them. The U.S. recently dropped its ban on the sale of nuclear reactors to China. The nuclear power industry had been lobbying Washington very heavily. At the 15th World Petroleum Congress Exxon CEO Lee Raymond said that the earth’s temperature is not getting warmer and that if it were, it wouldn’t be the fault of oil and natural gas. In the face of the evidence, this is a truly amazing statement. This sounds somewhat similar to the protestations of an alcoholic that he can quit anytime he wants and, in any case, he’s not doing any harm. The 30% increase in carbon dioxide since the inception of the industrial age is ascribable to nothing else. This is also a remarkable display of ignorance of basic combustion chemistry of any hydrocarbon. It is not possible to burn any hydrocarbon without producing carbon dioxide. Incomplete combustion will also produce other by products but carbon dioxide would be the only waste produce if combustion were perfect. Any energy conversion process that uses a hydrocarbon fuel will produce carbon dioxide as a waste product. A few weeks ago the CEO of British Petroleum admitted that global warming is a serious problem. Why the difference between the two corporate heads? BP has investments in solar power. Even though the remark is self serving it is still moving in the direction of a solution and is therefore helpful. Few issues have so clearly shown the deficiencies and defects of a price system in societal decision making. The nations of the world are defending their financial turf like junk yard dogs. They are pointing fingers at each other like grade school children. This has to be the modern version of fiddling while Rome burns. Over sixty years ago Technocracy proposed the construction of a continent wide electric power grid. At that time all the equipment would have had to have been designed. Now most of the required equipment is virtually off the shelf, although test lines would have to be constructed and tested. Most of the benign alternative power is obtainable in places that lack a use for it. Such a grid would permit the rapid efficient transportation of the power to where it is needed thereby displacing fossil fuel fired plants. The development of alternative power has been hampered by a lack of research and development funds. Research and development funds go to those with the loudest political voices. In other words, those with the most money. Any new technology, no matter how promising, requires a constituency, support of the rich and powerful, or nothing happens. Why? There are those who feel they would gain a direct competitor if the new technology were developed. There are those who feel that they would, at least, not gain anything from its development. Many environmental organizations support the development of some of these technologies. This represents a constituency. Why are these technologies so under funded? The answer is that those constituencies do not contribute enough to political campaigns to determine the outcome of who is in office and who is not. Again, the criteria for determining what is to be done by the society are decided by factors that have nothing to do with the actual question. Should these technologies be developed? Would society, as a whole, benefit? What would the consequences of not developing the technology in question be? It is also important to note that those making the decisions have little understanding of the issues. They must depend on the knowledge of others who do. Those others may very well have political or financial agendas of their own. Some of those in the energy business have stated that to do something about the accumulation of carbon dioxide in the atmosphere would require a drastic reduction in the standard of living. This is simply untrue. The U.S. has very low energy efficiency. There is much room for dramatic improvement. None of this would require severe sacrifices. Again, those with selfish agendas are promoting a campaign to benefit themselves. The real error made by those who understand the seriousness of the situation and want to do something about it is to blame those who fear doing anything. Most such organizations move to pass some new law that they feel will correct the ills. Many feel that by supporting the right candidate the problem will be solved. The sooner they realize that piling band-aid on top of band-aid will not solve the problem, the sooner they will realize what is really needed. The real problem is the strange, warped social structure created by living in a price system. This system establishes a social environment in which proper decision making is less and less likely. As time goes by and technology becomes the ever more ubiquitous, decisions become ever more critical and the consequences of bad decisions ever more devastating. People should realize that the burden of bad decisions will seldom be born by those making them. The average citizen will pay the price and it will be a heavy one. The longer the price system continues the more precarious becomes the human situation. Technocracy understood these six decades ago. It is still the only social system designed to operate our high energy civilization for the benefit of all its citizens.